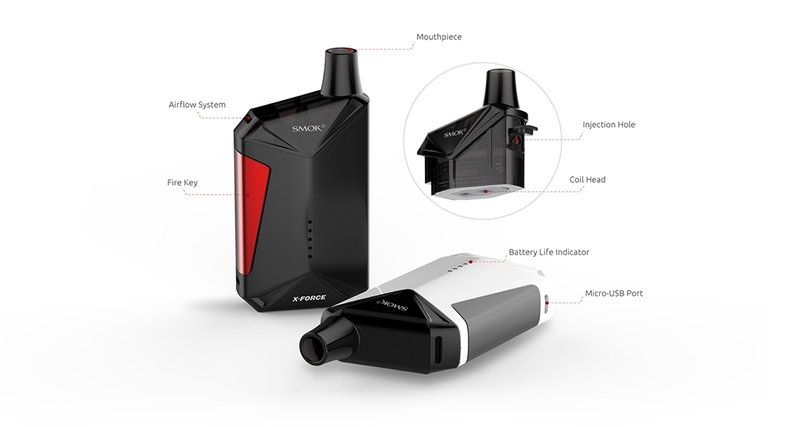 From the picture, we can know the X-Force Kit is an all-in-one pod system starter kit, but we can detach the battery and tank. Features one-button activation device with minimalist design, which consists of 2000mAh battery and 7ml tank. It comes with 5 LED indicators arranged lengthwise to show you the battery level. The tank with slanted design that can avoid the leakage problem. With 0.3ohm X-Force transverse coil, SMOK X-Force Kit will provide you with huge vapor with great taste. There are six colors are available.